I’ve thought about doing this before. From time to time I’m amazed to find that a jazz album I’m listening to was recorded in 1959. That very year. It happens over and over again but with different albums. So many. How many? I decided to do a little list. Some great records were made in 1958 too, as surely as other years, but there are so many groundbreaking ones from ’59. What did they put in the water that year? Do you have a left over bottle for me somewhere? Mr Wilson and Mr Gershwin was one of the first jazz albums I got. It has Teddy Wilson Trio playing songs by Gershwin (that had by then been resting is his grave for 22 years). Teddy Wilson was an amazing swing pianist with such a feel good air in his playing. EDIT: When I got this album on CD when I was in my teens it was in fact a double feature, also including an album with the same trio called …And Then They Wrote. And that was also recorded in 1959. Kind of Blue is the most famous one from that year. And unbelievable it is. Miles Davis also did Sketches of Spain that year. I love that album. Gil Evans doing his thing. Workin’ with Miles Davis quartet was also released that year but I believe it was recorded some years before although it was released that wunder year. A superb album but sounds like Miles (and Coltrane) did in ’56. Bill Evans came out with Green Dolphin Street the same year with the rhythm pair from Kind of Blue. A nice one. 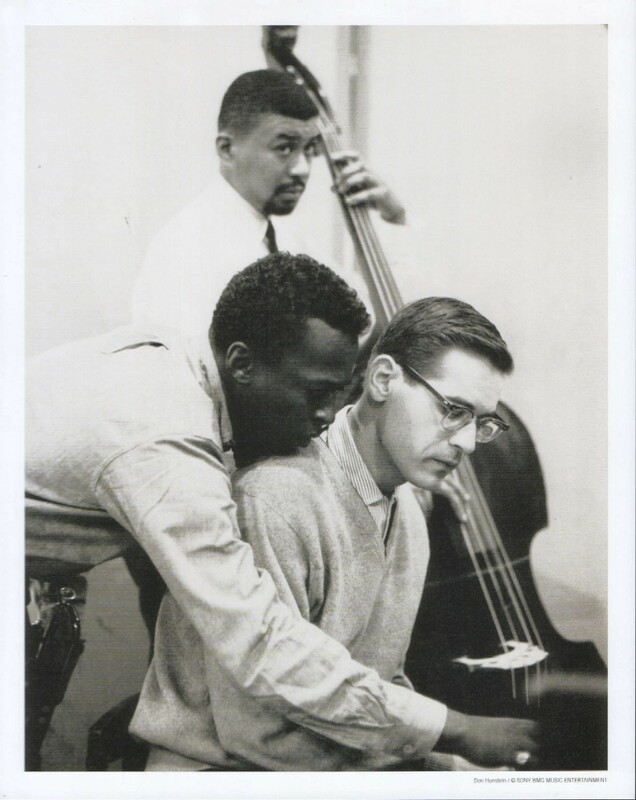 Bill Evans also did the first recording with his so called “first trio” including Scott LaFaro on bass that year, Portrait in Jazz. Recommended. Yet another Bill Evans appearance that year is on a Lee Konitz album called Live at the Half Note. Konitz has the coolest tone and a wicked way to approach melodies and then he tears the forms apart. Great to hear him with Evans which has other things on his mind, painting music with his water color piano. John Coltrain did Giant Steps the same year. I only recently started listening to it. I never felt ready before. Another milestone along the road. One of Jimmy Smith’s better records came out that year, Home Cookin’. Kenny Burrell plays guitar on it and that can never be bad. It’s really not for every one to listen through an entire hammond organ album but this one is fun. Kenny Dorham’s Quiet Kenny is another cool trumpet album from 1959. Just a great quartet and an echo chamber. I have a live recordings with Oscar Peterson trio from Newport Jazz Festival 1959. His Night Train rhythm pair is with him (which wasn’t recorded until 1962 (which saw a number of my favorites jazz album recorded)) namely Ray Brown and Ed Thigpen. They are burning as usual but there is an extra spark there that night. Maybe because of the others acts in Newport that weekend. Many of them must have been in the audience in that gig. The festival would have been the place to be that summer, the bands that played there…man! Count Basie, Monk, Art Blakey’s Jazz Messengers with Lee Morgan and Hank Mobley, Dizzy, Ahmad Jamal’s trio, Horace Silver, Jimmy Smith…Wow! And both Billie Holiday and Lester Young died that year. Completely drained after years of jazz living. Other legendary albums that come to mind that were released that amazing year, but I haven’t really studied yet and therefore not mentioned before were Dave Brubeck’s Time Out, Ornette Coleman’s The Shape of Jazz to Come, Mingus’ Mingus Ah Um, and Horace Silver’s Blowin’ the Blues Away. And the best thing about it is that you can still enjoy it today. You don’t have to be born in the 30’s or the 40’s to love this music. And it’s all here on the internet.